our beloved Peanut and to all of you that have lost your best friend. 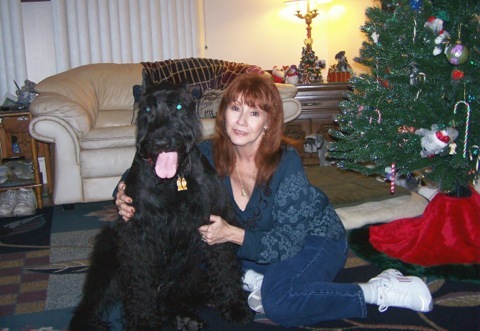 He was our Giant Schnauzer. He crossed the Bridge on August 14, 2009. He was our Mr. Big Guy and loved his toy schnauzer, Lil\' Sun. His daily thing was eating big bowls of ice. Sticking his head in the grocery bags to see if he and Lil\' Sun got any new toy when we came home from anywhere. He loved toys until the day he left us and he was 12 years old. He was never distructive and had his original Froggie toy. Loved Christmas and getting to open his presents. We miss him so much , but now we can think of all the fun time we had together and are thankful for that. He died of cancer of one of his foot. Other than that he was in excellent health. We want him back, miss him so much, but now we have a femal toy schnauzer to play with Lil\' Sun who was lost without his Big Guy. Gator is in Rainbow Heaven with our other 7 mini schnauzers.